One afternoon back in 2011, Amber Robinson noticed something strange about her left hand. What Robinson didn’t know at the time was that her bizarre hand symptoms were just the beginning—the beginning of her journey into the terrifying and lonely world of Lyme disease. Lyme disease, named after the town in Connecticut where it was initially described, is caused by Borrelia burgdorferi, a spirochete or corkscrew-shaped bacteria that commonly infects woodland animals such as rabbits, deer mice, songbirds, and most commonly, the white-tailed deer. Lyme’s main vector—an insect that is a carrier of a disease-producing organism—is the black-legged tick, an insect that’s barely the size of the period at the end of this sentence. The tick feeds on these infected animals, and if the infected tick eventually lands on and bites a person, it can spread the bacteria to its new host. Lyme could also be called ‘The Great Traveler’, since it is found on every continent except for the Antarctic. In fact, though already impressive, the habitat range of ticks is increasing every year as climate change warms the earth, thereby increasing the areas where ticks can survive. As one would suspect, the increasing range of ticks means it is becoming easier for one to be bitten by a tick. In fact, here in British Columbia, Western black-legged ticks are active for every season, posing a year-round risk. British Columbia represents the latest province where Lyme disease is endemic or well-established. Experts suspect that about 50 per cent of ticks in British Columbia are infected with Lyme, with the heaviest concentration in the Lower Mainland and Vancouver Island. Though tick bites are the most common way a person can become infected with Lyme disease, it is proven that pregnant women can pass it on to their unborn children. In addition, a prenatal infection of Lyme disease can make the mother more likely to miscarry. Not yet proven is the question of whether or not Lyme disease can be contracted sexually or through blood transfusion. Even though Lyme disease is considered the most pervasive vector-borne illness in North America, it has, for the most part, flown under the radar of most public officials and medical professionals. In fact, Canada’s Public Health Agency only started tracking the disease in 2009. Even so, some consider Lyme disease to be one of the most under-diagnosed diseases in Canada. In North America, more people contract Lyme than they do AIDS, West Nile and Avian Flu combined. Lyme disease certainly wasn’t on Robinson’s radar. “I don’t remember ever being bitten by a tick,” recalls Robinson. “But I did love to camp with my daughter over the years—we spent a lot of time outside.” In fact, spending time in wooded or grassy areas is considered the number one risk factor in contracting Lyme disease. Generally, ticks prefer humid environments such as forests, leaf mold, and on lawns and back yards where ticks climb up grasses and bushes on the edges of trails to wait for a new host to pass by. Because a tick bite is painless, many people, like Robinson, do not realize they have been bitten. To make matters worse, though some Lyme victims experience immediate symptoms after infection, others may be asymptomatic for months or even years. Symptoms, when they do appear, will sometimes disappear and then reappear at various times. Lyme can even go into a dormant stage in the form of cysts, sitting quiet in our system for years, even decades, until the right combination of stresses tip the scale. Soon after Robinson’s return from Mexico her symptoms began, starting with her hand and quickly growing into a long list of ailments such as joint pain, dizziness, debilitating fatigue, tinnitus, brain fog and carpal tunnel. The fact that Robinson lived for years not knowing she had Lyme disease has made her recovery especially elusive, since early treatment of Lyme disease is critical. When identified early, a short course of oral antibiotics will cure the majority of cases of Lyme disease. However, if left untreated, Lyme disease can cause permanent damage to the heart, nervous system and joints. Unfortunately, Lyme is very difficult to diagnose because symptoms vary from person to person. As a result, many Lyme disease sufferers are initially misdiagnosed with other diseases that have similar symptoms to Lyme, such as multiple sclerosis, lupus, Parkinson’s, early-onset Alzheimer’s, autism spectrum disorder and ALS. In fact, many patients with fibromyalgia, chronic fatigue syndrome and autoimmune diseases often have untreated Lyme disease. When patients who in fact have Lyme disease are not diagnosed or are misdiagnosed they do not receive the appropriate treatment, thereby exacerbating the symptoms. Like many with Lyme disease, Robinson was initially diagnosed with ALS. On her quest to find what was wrong with her, Robinson consulted with two neurosurgeons—the first who decided that Robinson was suffering from ALS. “After he told me that I had ALS, I spent the next couple of weeks preparing to die,” recalls Robinson. She even measured her living room to make sure that a hospital bed would fit and she ensured that her mother would be able to care for her. Even so, there was a small part of Robinson that refused to believe that ALS was the reason for her symptoms, so she asked for a second opinion. “I asked to see the other neurologist for a lumbar puncture and for some more nerve conductive tests,” Robinson says. After enduring more tests, the second neurologist informed Robinson that she was missing a critical component to ALS—conductive blocks—and therefore determined that ALS was not what was causing Robinson’s hand symptoms. The next day was a happy day too—and that’s also when Robinson started to suspect the real reason for her illness. “I remember that a ferry passenger commented that my smile was the biggest he’d seen in a long time,” recalls Robinson, who has worked for BC Ferries for the last 15 years. “I told him that I was smiling because I didn’t have ALS. I was surprised when he told me that he’d also been diagnosed with ALS, but it turned out to be Lyme disease.” That got Robinson wondering—could it be Lyme disease that was making her so sick? Lyme disease was now on Robinson’s radar, but she needed a definitive diagnosis, and unfortunately, that can be difficult to achieve. In order to be diagnosed, patients are told to look for a bull’s-eye rash known as Erythema migrans. The problem is that many Lyme sufferers—at least 50 per cent of Lyme cases—don’t present with the bull’s-eye rash. “I don’t remember ever having had the bull’s-eye rash,” Robinson says. Surprisingly, most physicians still use the bull’s-eye rash as a first indicator of Lyme disease. According to the Centre for Disease Control, Lyme disease should be determined using a clinical diagnosis, meaning that the physician makes the diagnosis using your clinical history and symptoms. Lab tests should only be used to confirm a clinical diagnosis. However, many physicians in Canada still depend on a test-derived diagnosis before treatment will be given. The problem is that the two-tiered testing protocol used in Canada and the US is riddled with false negatives and is unable to detect all bacterial strains and co-infections. As well, the first test—the ELISA—is ineffective in detecting the infection in its early stages. A negative test means the second phase—the Western Blot—isn’t applied, and closes the door on further testing and treatment. Through shear perseverance, Robinson finally received a diagnosis for Lyme disease. But the diagnosis was just the beginning of her battle. For most people diagnosed with Lyme disease, a large part of the battle is the cost of treatment. According to numbers provided by the American Centre for Disease Control, the cost of the disease in the United States is more than $3 billion annually—a financial impact borne largely by patients and their families. Here in Canada, the situation is no different. In fact, for most Canadians with Lyme disease, the cost of late-stage Lyme treatment is devastating. Most have to pay for their treatment out of pocket as long term treatment for Lyme is not covered under the Medical Services Plan. Paradoxically, many Lyme disease sufferers lose their income when they need it most, as they can no longer fulfill their job requirements. Since first being discovered in 1977, few if any diseases have held as much controversy as Lyme disease, especially chronic Lyme disease. In North America, the guidelines of the Infectious Diseases Society (IDSA) heavily influence most physicians. In fact, most physicians within the mainstream medical community are quite skeptical about the existence of chronic Lyme disease. IDSA guidelines state that there is no convincing biologic evidence for chronic Lyme infection and recommend only the short term treatment. IDSA guidelines advise that Lyme can be effectively treated with no more than four weeks of antibiotics, and any symptoms that persist after treatment are attributed to temporary residual effects of the Lyme bacteria, or even as psychosomatic. Lyme advocacy groups and ‘Lyme-literate’ doctors disagree with the IDSA guidelines. They believe long-term antibiotics are required to completely vanquish the infection. Long-term antibiotics are considered necessary because of the long division time of Borrelia burgdorferi. Most other pathogens, such as Streptococcus or Staphylococcus, only take 20 minutes to double, but the doubling time of Borrelia burgdorferi is estimated to be 12 to 24 hours. Most antibiotics are cell wall agent inhibitors, meaning they can only kill bacteria when the bacteria begins to divide and form new cell walls. Therefore, a slow doubling time means less lethal exposure to antibiotics. Most bacteria are killed in 10 to 14 days of antibiotic treatment. To get the same amount of lethal exposure during new cell wall formation of a Lyme spirochete, the antibiotic would have to be present for much longer—some experts estimate that antibiotics need to be present 24 hours a day for 18 months to completely eradicate the Lyme bacteria. 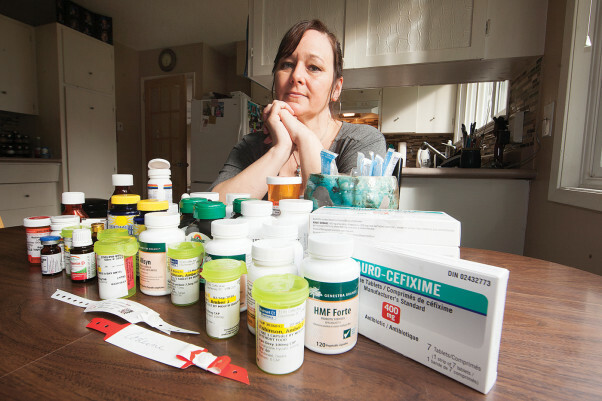 The problem is that Canadian doctors who’ve treated “chronic Lyme” with long-term antibiotics have been disciplined and/or seen their medical licences revoked. The result has been a medical standoff—and an underground Lyme treatment network that sees Canadians travelling to the areas in the US called Lyme-leper colonies, and paying upward of $50,000 for treatment. The treatment for Lyme might improve soon here in Canada, thanks to Elizabeth May, Green Party leader and the MLA for the Gulf Islands. In 2012, May decided to fight for Lyme disease sufferers when she put forth her private members bill C-442, titled the Federal Framework on Lyme Disease Act. C-442 calls for a coordinated strategy to track the incidence rates, create educational materials to raise awareness about Lyme disease, and establish testing and treatment guidelines. It also calls for research support and more reliable diagnostic testing, as well as increased education and awareness among physicians. Unlike most private members bills, C-442 passed unanimously at third reading by the Senate on December 12, 2014 and now awaits Royal Assent by the Governor General for it to become law. Though the future of Lyme disease treatment may be changing for the better, at present those with Lyme disease have a hard battle to fight. And Robinson has every intention of turning things around, but she needs some help along the way. Robinson’s longtime friend, Paige Ennis, set up a fund raising page at YouCaring when she saw what her friend was going through. “I admire Amber so much,” Ennis says. “She has no choice but to go to work every day because it’s tricky here in Canada when you have chronic Lyme disease. Amber wants to enjoy life to the fullest. To live and be free. But Lyme disease has really tied her down. “The fundraising site…well, it’s had almost 400 shares, but only a handful of donations. I want people to know that any amount is appreciated—even $20 or $30 makes a huge difference,” adds Ennis, who is hopeful that those who read this article will go to the YouCaring page and help Robinson as she faces her battle with Lyme disease. As I walk through the door of the Evergreen Club I am greeted by a round table of smiling eyes and friendly hellos. Bob Miles has invited me to today’s singing practice of the Evergreen Choristers and a few of the members are waiting for me in the Evergreen Lounge. The group, which meets every Friday morning to sing, currently has 79 members, all of whom also belong to the Evergreen Club. The Evergreen Club, formerly known as the Evergreen Seniors Club, is located downstairs in the Florence Filberg Centre in Courtenay and is home to a variety of groups aside from the Choristers. Some of the other groups include activities such as drama, quilting, gospel singing, golfing, photography and games like mah-jongg, Mexican train, or bridge. The groups typically meet once a week to take part in their activity. A monthly newsletter posts information about each group and outlines dates to remember, such as meeting times and special evening events. There are Friday night dances with live music, seasonal celebrations and movies. Feature menu items from the Evergreen Lounge, a volunteer run kitchen at the centre that serves food Monday to Friday from 8:00am-3:30pm, are also printed in the newsletter. The Choristers have been singing for nearly 20 years and are often invited to events in the Valley and on Vancouver Island. Some of the venues they have performed at include The Cumberland Fall Fair, The Filberg Lodge, The Variety Show, and The Anderton Therapeutic Gardens. Every month the Choristers also visit five different places for seniors living in the Comox Valley including Casa Loma, The Views, and Glacier View Lodge. Miles emphasizes the importance of going to sing at such places. “The homes we sing at are, for the most part, people who don’t get out any more. Many of the people have dementia. They’ve always enjoyed us coming in,” he says. Forward is the official “guru of music” for the group. Each month he puts together a booklet containing 25 to 30 songs, which the group sings­­ together on these Friday mornings. The songs are different every month, and each month the songs compiled in the booklet are based around a new theme. For November the theme is ‘Saluting our Veterans.’ January will be ‘Around the World’, February is ‘Love Songs’ and April will be Hits from the Fifties.’ “My favorite ones,” says Forward, who takes requests from Choristers for what songs they would like to sing and also posts upcoming songs on the back of the choir’s booklet. “We do a little bit of every type of music,” says Miles. “It’s pretty hard to get bored of it.” Miles has been with the group just over a year. While the main purpose of the group is as a social activity, and of course to sing, part of what the Evergreen Choristers do is to reach out into the community to entertain people and connect with them. “People often have an attitude that seniors need to get in the background. We’re still valuable,” says Miles, who wants people to know that seniors still have much to offer. The conversation reflects how seniors are often put into a niche. Miles challenges this—he wants, “to point out no matter what the age, we’re still of value in the community.” While singing at different events and seniors homes on a regular basis as a solo act, the Evergreen Choristers also work in conjunction with others whenever they can. November finds the Choristers attending the second annual Memories of the War Years: a Musical Tribute to Veterans on November 2. The event, created by Ken MacLeod, is a chance to unite all veterans, the military, The Royal Canadian Legion, the cadets, and the Pathfinders of our community. After they perform at this show, theys will head to the Child Development Telethon. Evidently the Choristers are much more than your average singing group. Miriam Pikkila, who has been with the Choristers for a number of years, has two scrapbooks that capture some of the group’s history. It is filled with pictures, invites, thank you cards and memories, showcasing the extent of the Choristers presence at events all over the island. Pikkila is also well known in the Valley for performing as a clown. In the scrapbooks, pictures of her in colorful costumes with the other “clowns” are interspersed with the Choristers. Flipping through the pages one gets a sense of the fun loving spirit that permeates this group, and the variety that the individuals bring. “For me, it’s enjoyable” says Miles. “I used to be in a band that sang the same songs and I got tired of singing… This brings back my interest. “If you go off key, laugh it off, and away you go again” he adds. Now it is time for the singing part of our interview, and I head into the Rotary Hall. I am amazed to see how many people are in the room, and I am met with their voices in harmony. As the song ends I am introduced and a woman near the front speaks out: “I hope you write nice things about us!” I am ushered across the room into a seat where I am able to enjoy the singing and have a good view of the stage. Accompanying the singing is an accordion, a piano, and a flute, which trills around the melody of the song and often ends in a soft lilt. “There are a lot of people here that do a lot of work to make sure this works,” she says. After this the monthly birthdays are acknowledged and we all sing happy birthday. It is a comfortable and joyous experience filled with songs and laughter. The time slips by quickly and easily. Looking around the room I think of how many stories are here, and how many different people with different histories have arrived here for today, for this hour and a half, to sing. It’s definitely brightened my day to be in their company.